"The final dungeon room at last… Let's fight the giant dragon boss then get that treasure ! What an adventure !" A castle, a dungeon, a dragon, a queen to protect... and above all, an imagination to preserve ! Your child dreams of a knight themed room ? Set up an original wall decor entirely designed by our design studio so that our little knights can live their first great adventures in their rooms. 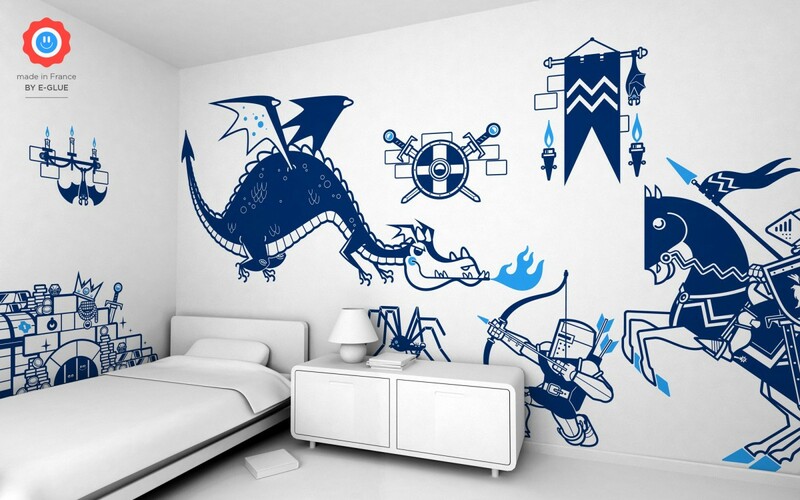 The knight wall decals allow you to easily create a fantastic world with a guaranteed modern decoration. For example, see below a wall decal Treasure (dark blue and light blue) applied on a light grey wall.